Fresh red, yellow, and purple tomatoes, beautiful salad greens, and pumpkins are just some of the delicious vegetables delivered to residents and retreatants at Upper Hamlet in Plum Village. The Happy Farm team provides organic products farmed and harvested with much care, love, and mindfulness. Stuart Watson, Happy Farm manager, and Daniel Dermitzel have coordinated and inspired many of the farm’s interns and monastics by sharing their passion, respect, and love for Mother Earth. Happy Farm is located in Plum Village but is self-supporting and independent. During the past three years, it has grown by thirty percent and has relized many wonderful developments. Each year since the first harvest in 2013, the farm has increased its yield. In the first year, the farm grew 15,000 Euros worth of organic produce, then 25,000 in the second year, and 32,000 in the third year. “It pleases us to see the growth,” says Stuart. The infrastructure of the farm continues to improve as well. Last year a shed was built to store equpment, and a commercial-size polytnnel was constructed to create indoor growing space and eneable yearlong growing of produce like tomatoes, eggplants, and cucumbers. Another major development is the installation of a compost system. All food waste from Upper Hamlet is delivered to the farm and turned into high-quality compost for the fields. Happy Farm also supports heart-to-heart connections, nourishing not only bodies but spirits. As Thay teaches, “Body, speech, and mind in perfect oneness.” The farm is integrating inner and outer worlds to harmonize our life. During the past year, Stuart and Daniel have increased educational programming by giving workshops on mindfulness, sustainability, and growing organic foods, as well as workshops geared toward children. In June 2015, they hosted the first “Happy Farm Retreat,” which was a great success with more tha n350 participants learning about sustainability and mindfulness applied in an organic farm context. This past spring, Stuart, Daniel, Thay Phay Dung, and Thay Phap Luu held a weekend retreat at the European Institute of Applied Buddhism in Germany, where they shared about sustainablity, community living, and bringing mindfulness into a work environment. 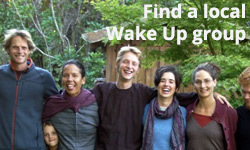 This past summer, Happy Farm and Wake Up hosted “Wake Up Earth,” a retreat about mindfulness, organic growing, and reconnecting with the tremendous healing power of Mother Earth. “Happy Farm has the capacity of inviting us to return back home,” says Daniel. Happy Farm has a wonderful yearlong internship program, which starts with immersion in the practice of mindfulness during the three-month Winter retreat. After the retreat, participants apply their practice experience to organic farming, sustainability, and living in community. “The program has been very successful,” says Stuart. Many participants finish thei nternship with strong knowledge about organic farming and sustainability. Thay teaches that if conditions are sufficient for things to manifest, then they will manifest; if not, they will transform. After spending eight years with the Plum Village community, Stuart is being called to live a more conventional life focused on family and a postgraduate degree in psychotherapy this Autumn. Daniel will also step away from the farm this year. Both of them are open to being involved in future projects with the farm and will continue to practice in the Plum Village tradition. Reconnecting with Mother Earth is the way. Sisterhood and brotherhood is the way. Organic farming is the way. Sustainability is the way. Mindfulness is the way. To learn more about Happy Farm click here. Denisse Aguilar, Awakening Lotus of the Heart, is from Tijuana, Mexico, and co-facilitates a Sangha in her hometown. 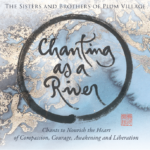 Inspired to make Thay’s teachings available to Spanish-speaking communities, she translates for Sangha events and transcribes and translates monastics’ interviews for Wake Up. Her deepest aspiration is to be a positive influence on her community and society. Reprinted with permission from the Mindfulness Bell, Summer 2016.